For the Café in the Square project, Block Architecture and NORD are collaborating with Structural and Environmental Engineers Buro Happold to produce a combined proposal. Block Architecture are a London based Architecture and Design Practice established by Scottish architects Graeme Williamson and Zoe Smith in 1998. Over the last 5 years their work has been critically acclaimed for its innovative and experimental approach to architecture through commercial, residential, retail, arts and exhibition projects mainly in London but also in New York, Stockholm and Tokyo. During this time they have worked with individuals, companies and institutions that include : BAFTA, Blueprint, The Breakfast Group, The British Council, Hussein Chalayan, The Institute of Contemporary Arts, Modern Art Oxford, The Royal Institute of British Architects, Selfridges, Tomato, The V&A Museum and Virgin Atlantic. Although fundamentally an architectural practice, Block were named Blueprint Interior Designer of the Year for 2005. Glasgow based NORD (Northern Office for Research and Design) was set up by Robin Lee and Alan Pert in 2002 shortly after Alan was named Young Architect of the Year at the prestigious Scottish Design Awards. 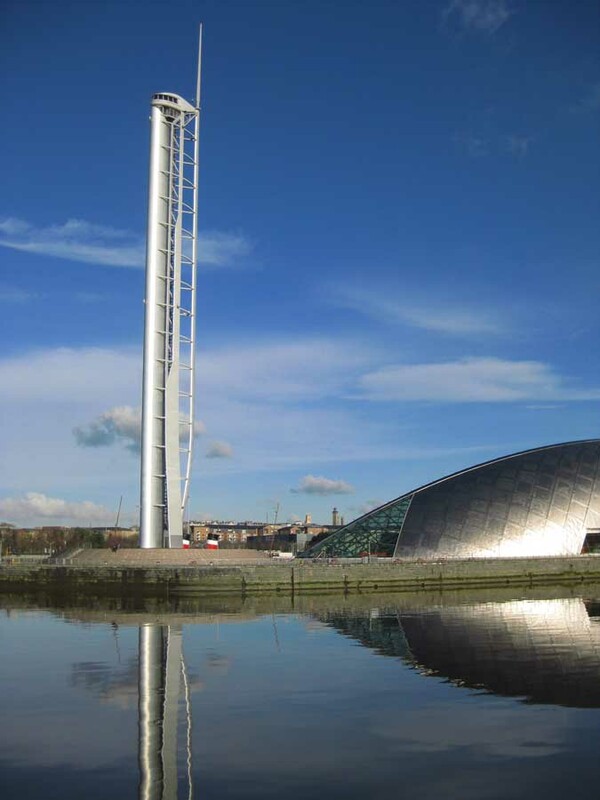 They have forged a reputation for high quality award winning designs in the leisure industry in Scotland and have produced a broad body of work in the residential, commercial and arts sectors. NORD have completed a range of exhibition designs for the Scottish Executive and The Lighthouse including the design of the Scottish exhibit at the 2004 Venice Architecture Biennale. NORD recently won first prize in the Architects Journal Small Projects Awards for the best building in the UK under £250,000. Within the context of the square, the proposal can be seen as a assemblage of recognisable Victorian civic elements; plinth, planting and public seating. Absent from this vocabulary is a fountain or water feature, familiar objects commonly found in civic public spaces. Glasgow has a number of fountains, some of which are often highly sculptural. They can be associated with places to meet, to sit or reference points within a city. They can also create tranquil spaces to linger. Our approach will introduce a water element to the square in the form of a building, drawing on the language of the square but adding to its vocabulary. In tandem with this, the building also aims to address broader held external perceptions of Scottishness and draws on recognisable landscape of stone, heather and water. The contextual overlap of these elements extends the vocabulary of the square by simultaneously introducing plinth as stone, planting as heather and fountain as waterfall. The café: inside & out – our aesthetic inspiration comes from ‘Nighthawks’ by Edward Hopper; an image that completely dissolves the notion of a barrier between inside and outside; the life inside the café intertwines with the life and the city outside. The people inside become part of the street and the street life becomes part of the experience of the café. 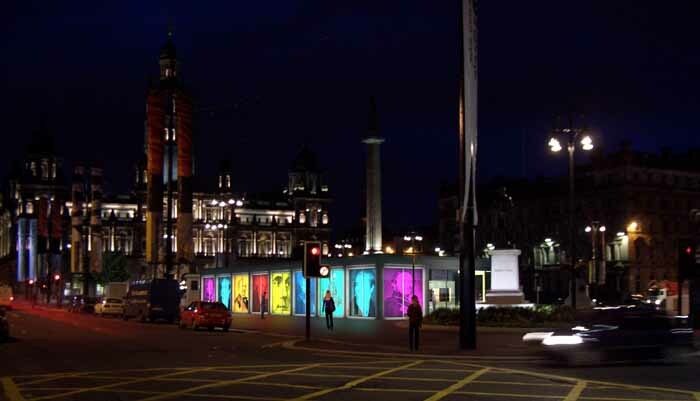 By day George Square will be part of the café interior, by night the glow of the interior will illuminate the public realm – a constantly changing vista both inside and out. The Empire Diner in New York City a linear café, efficient and aesthetically memorable. A part of the urban landscape regardless of its object nature. The Empire café transcends fashion – it is impervious to the whims of the zeitgeist. Our proposal strives to root itself in a social and urban context, through subtlety of form, detail and materiality and thus ensuring that the Café is a Glasgow landmark for as long as the other tenants of George Square. Our proposal is clad in black basalt & a stone of volcanic origins. It is hardwearing, yet it has a delicate and varied texture. Basalt has a presence and relates to the rich geological history of this country and the rich diversity of stones found in Glasgow architecture. The interior of the cafe is lined in warm, red toned timbers, creating a warm contrast to the hard nature of the stone and reflecting the rock in its natural molten state. Incised into the surface of George Square is an imperial measuring scale – a reminder of an earlier era, a reminder of an industrial past. This regular demarcation is reflected in the rhythmic layout of George Square and the gridiron layout of the city centre. This rhythmic delineation informs the proposed café building, both in layout and in proportion. This rhythm ties the café into its context – past, present and future. George Square used to be on the periphery of the city, not a formal public square but a marshy wasteland. This memory is subtly transposed onto the proposed building with a subtle etching on the glazed walls to reflect a longer historical timeline that runs from today’s George Square through Glasgow’s constantly changing history to the fiery origins beneath our feet. The Café in the Square allows us to embody a simple tale; ‘The House with the Golden Windows’. 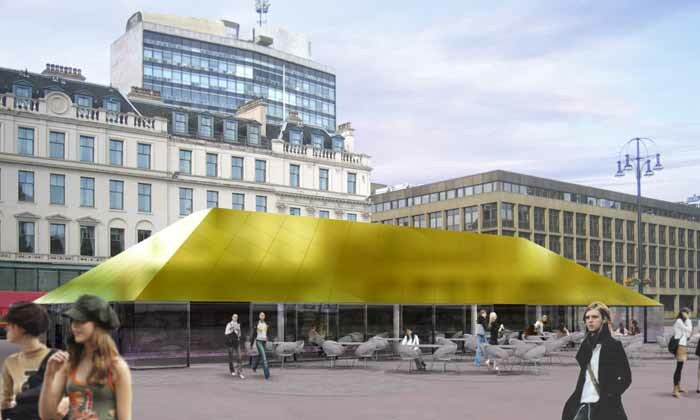 Rendered in gold glass, the café form is crystal clear. The glazed reflective skin reacts instantly to changing light – always positive and optimistic. The pavilion becomes immediately a part of the city and at the same time apart from the business of the city. 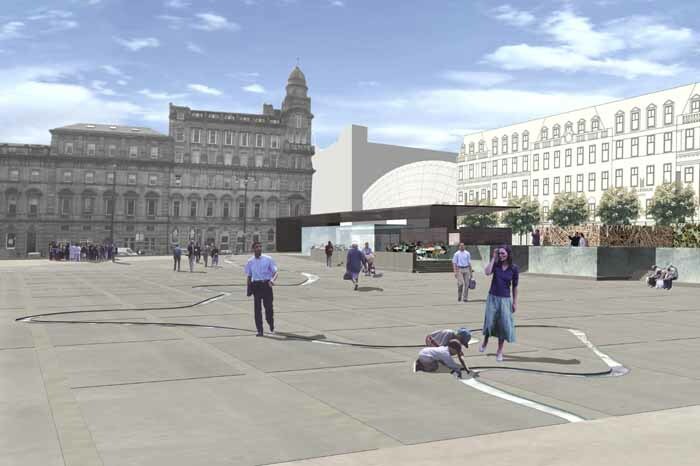 George Square is a space of great significance to the centre of Glasgow but its layout and design do not match that importance. The possibility of a new Café building in this space gives us the opportunity to also look at how the Square could be reorganised and improved to the benefit of the city. The strategy for the design is to create a long thin building which places the café area facing the square and the service spaces of the café forming a buffer between the roads around its edge and the seating areas. This allows us to place as many tables as possible in the window enjoying the view across the square. We have chosen to locate the building on the west side of the square as this allows it to face the City Chambers at the East end of the Square and in front of it the Cenotaph and the statue of Sir Walter Scott. This gives a stronger order to the layout of the Square and a definite location for the café which can occupy the whole of the short side of the square. The many statues are important to the square but we feel they are lost at present in the visual clutter of street lights, surrounding buildings, and the vast expanse of red tarmac. In placing the building on the west side of the square we have to relocate the statues to that side. We propose moving Queen Victoria and Prince Albert so that they stand at either end of the café and are incorporated into it by their enclosure within the external wall and by the extension of the roof to form a canopy over each. We have suggested removing the tall granite plinths to lower their overall height. These Royal statues and the canopies over them become the identity of the scheme and perhaps even lend their names to that of the café. We have suggested then that the other statues in the square could be reorganised to stand in a single line across its west end, between the café and the rest of the square. This would give them much greater impact in the large space and draw more intention to the people they represent and their role in history. The resultant line of statues will further help to define the space of the café and act like a filter between external spaces. This would also allow the large space required for events within the square to be maintained. Clearly moves of this kind and the landscaping associated with them are out with the scope of the budget for the café itself but we feel they should be considered for the future of the square as a whole. The building is laid out as two linear elements either side of a thick central wall. This wall extends out from the ends of the building and wraps around the external seating areas to give them shelter from the traffic on the roads around the square and the wind and weather. Inside the wall is a double thickness which allows seating and other elements to be set into it on both sides. The intention is that this wall is made of red sandstone. In the café space a long roof light sits above this wall and will cast an ever changing pattern of light and shade along its length enlivening the interior. These patterns of light will be visible through the glazed screens to the square drawing the eye into the interior. In the centre of the wall we have placed the opening for the bar and servery. The servant spaces are organised against the back of the wall with their circulation along the west edge of the building. This allows us to create a translucent wall to this side. This will allow patterns and shapes of movement to be visible behind the glass and at points along its length perhaps slots of clear glass could allow glimpses through the bar to the café beyond. We envisage this glass wall – which is made of the ‘Reglit’ glass panel system – will have lighting within it to cast changing patterns of coloured light through the glass so that at night this wall is also ever changing. It would be interesting if this could be conceived as an Art work developed with an Artist working with light. The façade to the square is of glazed screen doors which can be opened in summer beneath the hinged security shutters creating sheltered external seating spaces. Between the panels are solid panels, openable to allow local ventilation. This is all set within a steel frame carrying the aluminium roof above. The principal entrance is at the north end of he building where a doorway through the central wall leads to a lobby space and then into the café area. The wall of this lobby carries the café sign. A door also leads into the external seating area. At the south end of the building a further small lobby gives access to the southern exterior seating and also forms a secondary entrance to the café. In order to allow some security to the external spaces sliding gates are incorporated into the entrance lobby wall to close off the spaces below the canopies and prevent tables, for instance, being stolen. Within the servant part of the building are enclosed all service elements, washrooms, staff room, servery areas kitchens and storage. At the extreme south end of this rear wing is the ‘ToGo’ area facing the south west corner of the square. This is conceived as separately functioning element although linked to the service spaces, but with glimpses through the stone wall to the café beyond. The building is conceived with a simple palate of hard wearing, quality, materials. The colour of the red Locharbriggs sandstone wall will root the building in the palate of materials used in the City and be enriched by the patterns of light and shade falling on it. The rear glass wall again can be enriched by light and its translucence will benefit both interior and exterior spaces. It is hard wearing and easily cleaned. We should note that these panels, which were developed for industrial use are also extremely tough and resistant to damage. The standing seam aluminium roof allows us to create the simple lightweight roof canopy but again is a quality material with a long lifespan and good recyclable value in the future. The steel framed glazed screens and security shutters are also simple strong elements providing enclosure and view. These materials also provide the internal wall finishes. Floors within the servant spaces will be entirely utilitarian sheet or screed finishes. In the café space we would like to use the same stone slabs as suggested for the immediate external court of the café if this can be developed within the budget. This would allow a seamless transition from interior to exterior. Finally a simple mono-pitch roof-light, framed in aluminium will run the length of the building casting light and shade on the wall below. It should also be noted that these materials are all inherently low maintenance with no requirement for repainting for instance and with no applied coatings that are likely to fail in the short term. Simple cleaning regimes should be all that is required. It is not possible to entirely prevent Graffiti and other vandalism but we aim in the design of the glass wall for instance to provide surfaces which do not readily take graffiti and which through the design of lighting discourage the wall being seen as a target for this. The possibility of enclosure of the external spaces allows tables and chairs to be put away reducing possible vandalism and theft. Richard Murphy Architects was formed 14 years ago and has established itself as one of the country’s leading design practices. Richard Murphy received his diploma in architecture from Edinburgh University in 1980 and returned to teach design in the Department of Architecture at the University from 1985 to 1989. During that period he undertook an extensive research programme into the work of the Italian architect, Carlo Scarpa, and has written two books and subsequently presented a Channel 4 documentary about Scarpa’s work. After leaving the University and directing the office of Alsop & Lyall in Edinburgh for two years, Richard set up his own office in 1991. In the 14 years since, it has achieved a remarkable number of design successes. These include thirteen RIBA Awards, three RIBA National Awards, one RIAI Award, three Edinburgh ‘Building of the Year’ Awards, a Civic Trust Award and two Commendations, a Royal Scottish Academy Gold Medal and the RIAS/Scottish Enterprise Regeneration of Scotland Supreme Award 1999 & 2000. The early reputation of the Practice was built on highly crafted and innovative domestic work in the Edinburgh area, but in the last six years the office’s scope of operation has expanded considerably – nationally and worldwide. Our past major projects include Dundee Contemporary Arts (£6 million), Stirling Tolbooth Music and Arts Centre (£4 million) and the Jack Kilby Computer Centre at Napier University, Edinburgh (£4.5 million). We have recently completed the Eastgate Theatre (£2 million) and Arts Centre in Peebles and the Galeri Creative Enterprise Centre in Caernarfon (£4.4 million). Current projects include £70 million of housing projects in Edinburgh. The practice has been appointed to design a new British High Commission in Sri Lanka and more recently to renovate the British Embassy in Skopje, Macedonia. It is also won a commission to build a new secondary school in Mosta, Malta and is working with the University of East London, masterplanning its Stratford Campus, which includes the design of a new podiatry unit, computer centre, education department and miscellaneous new support service buildings. Most recently, planning consent has been approved for the refurbishment into residential accommodation of the former Donaldson’s Deaf School in Edinburgh, a Playfair Grade A Listed building built in the mid nineteenth century. In an article in the Sunday Times, Hugh Pearman coined the phrase ‘maximalist’ for the Practice’s work; that is the greatest architectural effects are obtained from the smallest and least promising contexts. Richard Murphy Arhitects define its goals as to make architecture equally of its place and of its time. This approach looks equally at careful contextual responses to designing within and adjacent to existing buildings and also constructing new buildings within the contexts of established landscape and urban patterns. Last year, Richard Murphy Architects work was shown at the prestigious Biennale Exhibition in Venice, the first Scottish Practice to be invited to do so. 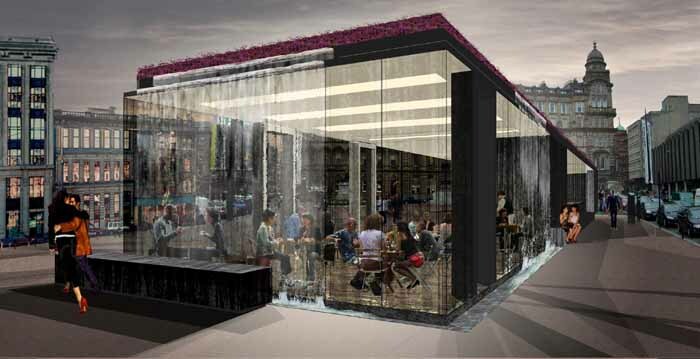 The Café in the Square project is an exciting opportunity to design a simple, calm, high quality pavilion building appropriate for its civic location. 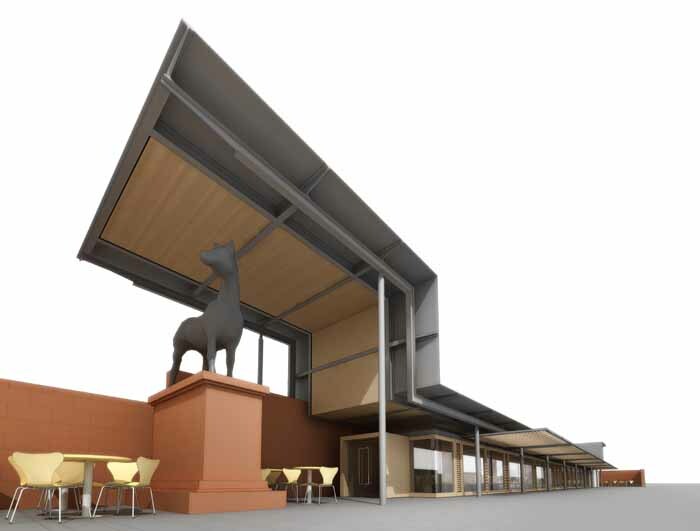 Our proposal is a pure sculptural form which sits comfortably next to the listed statues within the square and listed buildings surrounding the square. RMJM have grown over half a century to become an acclaimed international practice, RMJM combine the benefits of experience, knowledge and stability of a large organisation with the passion, creative flare and dynamism that a small practice can offer. Glasgow City council were our clients and commissioned us to take a run down listed property, and create a Womans refuge day care centre. RMJM can bring a holistic approach to this project through the dynamic collaboration process that is multi discipline working. We propose to offer an all skills approach, providing Architectural, Structural, M+E, Visual Arts and Landscaping disciplines, which offers the benefits of an integrated design approach and a collective responsibility. RMJM are committed to energy conservation and a sustainable approach to building and we offer expertise and experience in both fields. With the use of computer simulation we can predict the performance of the building services and the future running costs of the building, enabling Glasgow City council to balance initial outlay with future savings in energy bills. Our accreditation as BREEAM assessors demonstrate our aim to pioneer best practice in sustainable design. One of RMJM.s stated aims is to innovate to improve performance and produce value for our clients. Examples of innovation range from the development of low energy building forms, to the design of individual components such as light fittings abd street furniture. Often innovation is a direct response to resolving a conflict or contradiction and by confronting this apparent paradox we are able to produce something radical. There is a desire for innovation and the the latest technology without becoming seduced by or being in awe of them. RMJM are committed to the care and the improvement of the environment and the communities in which we operate. We have taken a leading role in promoting environmental best practice in the move towards sustainability. Environmental leadership means that our own environmental standards must be exemplary and that by using our expertise, we can help our clients to discharge their environmental responsibilities. This principle is at the centre of our business processes, It also plays a major role in the development of our designs, providing practical and innovative solutions to the challenges of modern construction. To this end we support and encourage others within our project teams to do the same. As architects and engineers we acknowledge that of all our activities, it is the buildings that we design that have the most significant environmental impact. We play an important role in the protection of the environment and are therefore committed to minimizing the environmental impact of our buildings during their design, construction and use. RMJM operates fully networked and co-ordinated draughting facilities across all disciplines, allowing parallel working, improving efficiency and allowing on line co-ordination. 3-D computer modelling is used throughout the design process to visualise the design and enable client and team to see the building and interior spaces during the design stages. Who are Doig + Smith? Doig & Smith Chartered Surveyors was founded in Glasgow in 1936 by David Doig CBE. For over 70 years the Firm has progressively expanded to achieve its current position as one of the leading firms providing construction related consultancy advice. The Firm is a partnership and currently the five partners have the support of nearly eighty technical and administrative staff located in our Glasgow head office and in our Edinburgh and London offices. – We have a partner agreement with BAA as an integrated team member. There is no individual party interest, the consultants operate as a single purpose project team. StudioKAP, chartered architects was formally set up by partners Roderick Kemsley and Christopher Platt in 2002. 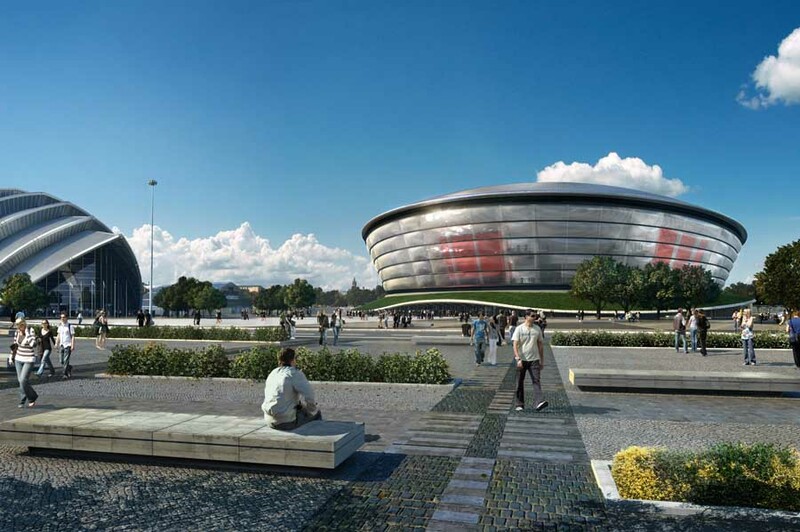 The office currently has six architectural staff and is based in central Glasgow. Christopher Platt and Roderick Kemsley have over a number of years built up a body of shared experience through both joint and individual work in Germany and the UK, in practice and in teaching. In all these spheres our work has come to focus on the architect’s unique role as place-maker. We believe good architecture is the fruit of close, creative collaboration with clients, consultants and contractors and the pursuit of concept through to detail in both design and realisation. We strive to develop the ambitions of both architect and client into a shared agenda, as we believe that such a framework enables the making of places of distinction, which relate closely and constructively to the lives they serve and shape. Somewhere within that care for the intimacy of the ‘bits’ of a building in combination with and as complement to its ability as a whole to project into the world beyond is where we feel the key to the success of a project lies. George Square cannot be elevated to the stature of a ‘Civic Space of International Quality’ by simply the introduction of a new café-however beautiful. Our proposals therefore attempt to address the wider urban design problems at their root by considering a series of fundamental and inter-related issues. This involves strategies for traffic management, reordering of statuary, improving the relationship with Queen Street Station and other parts of the city, new flooring surfaces and crucially the re-statement of the perimeter of the Square where a new café can contribute meaningfully.